Knaresborough Town suffered a first defeat in 10 NCEL Premier Division outings, going down 1-0 at home to promotion rivals Penistone Church. 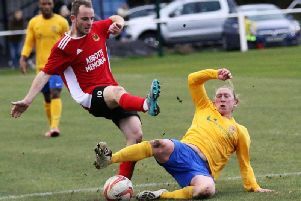 Victory would have left Paul Stansfield’s team three points clear of Saturday’s opponents and just six behind leaders Yorkshire Amateur having played three games less. Yet, despite not being able to find a response to Gregg Anderson’s early own goal at Manse Lane, Boro remain well-placed, knowing that if they win all of their matches in hand then they will pull level at the summit. In what was a closely-contested affair throughout, Knaresborough won a third-minute corner and Dan Thirkell almost broke the deadlock, heading Ben Cohen’s kick against the post. The visitors manage to scramble the ball away, but only as far as Brad Walker, who fired narrowly wide. 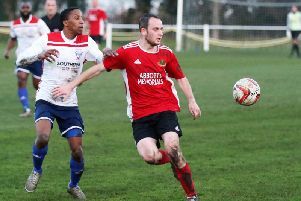 The home side were then left appealing for a free-kick in the Penistone half following a challenge on Nick Black, however Church were allowed to break down the right wing where a low cross evaded Nathan Keightley only to hit Boro man Anderson and enter the net with 13 minutes on the clock. At the other end, Luke Stewart shot narrowly wide before Chris Snaith in the visitors’ goal saved a first-time effort from Black with his legs. Keightley saw a strike deflected wide for Penistone and then Stewart slotted just wide of the far post after Walker’s pass played him in wide on the left. Home custodian Jack Rushworth had to make stops from Kieran Ryan and Keightley soon after the break, but Knaresborough countered, Snaith again used his legs to keep out a Cohen strike. Keightley had a further chance deflected for a corner before the hosts’ best chance of the afternoon fell to Rob Youhill. The ball broke to the ex-Tadcaster Albion winger in the area, though Snaith was equal to a well-struck shot and then also managed to deal with Walker’s follow-up. Another Walker chance went wide before a late free-kick from Danny Howes flew over Rushworth’s bar and the contest ended with Penistone’s narrow advantage still intact. Next up for Boro is another crunch clash with leaders Yorkshire Amateur, 3pm kick-off at Manse Lane on Saturday.